Agreement on increasing Russian-Chinese trade turnover, bilateral investment and terms of Russian gas supplies to its neighbor are the main topics of negotiations as Chinese leader visits Russia on an official four-day visit. 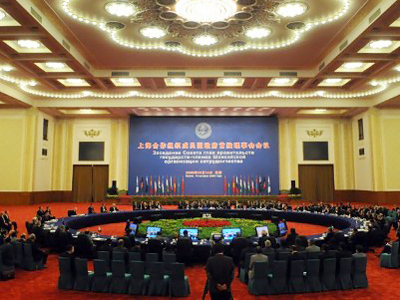 The leaders of two of the world's biggest and fastest-growing emerging economies have met in Moscow on Thursday. Russia and China share a wide range of common interests, with Moscow becoming an increasingly important supplier of energy, fuelling growth across its southeastern border. 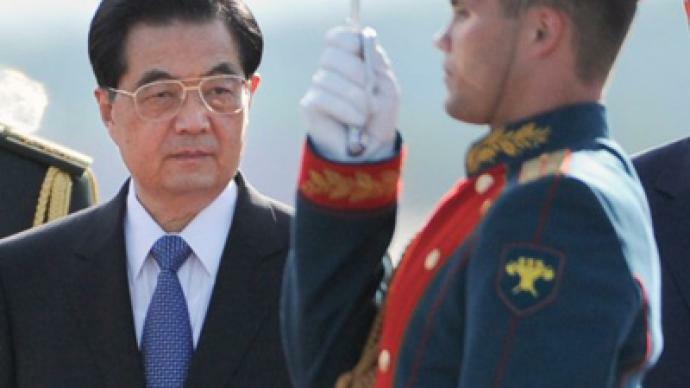 Chinese President Hu Jintao is on an official visit in Moscow at Dmitry Medvedev's invitation. Gas issues seem to be taking up most of the day’s agenda in the meeting between the leaders. Russia and China are each other’s biggest neighbors, and both sides have much to gain from a productive relationship. Both sides, though, say there is still a lot of room for improvement within their bilateral relationship, and that is what both Hu Jintao and Dmitry Medvedev are looking to achieve during the meeting. Russia is one of the largest suppliers of natural resources, such as oil and gas, while China is a very lucrative market for Russia. The trade turnover with China is one of the biggest Russia currently has. Although they have agreed to increase their bilateral trade turnover to $100 billion by 2015, and up to $200 billion by 2020. After meeting with President Medvedev, the Chinese leader met Russian Prime Minister Vladimir Putin and Gazprom CEO Aleksey Miller at Gazprom’s headquarters in Moscow to discuss the agreement over Russian gas supplies to China for the next 30 years. The legally-binding agreement was signed in September 2010, but the price remains a stumbling block in the issue. Russia's intention is to set the price at $306 per thousand cubic meters – the same as for Europe – but the Chinese side is pressing for a discount. According to the Gazprom CEO Aleksey Miller, the agreement for gas supplies to China is supposed to be signed in 2011. This is a beneficial deal for both sides. Russia will receive billions of dollars in revenue, and the Chinese will receive the fuel they need to continue their economic growth. During the meeting in Gazprom’s main office, Miller also assured that after the disagreement over prices is solved, Gazprom will start building a pipeline to China. The deal makes provision for western and eastern modes of gas supplies from Russia .The former is supposed to use resources of Western Siberia and the second Eastern Siberia, Far East and Sakhalin Shelf off Sakhalin Island. 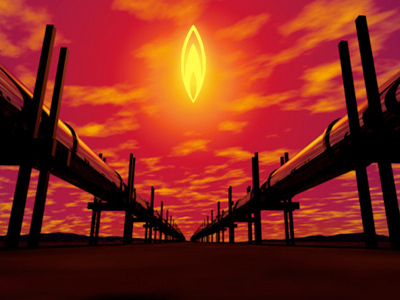 The basic, western, mode is the gas pipeline Alta, which Gazprom is ready to start building in the middle of 2011, with supplies commencing at the end of 2015. The western route is expected to supply about 30 billion cubic meters of gas per year, and the eastern 38 billion. 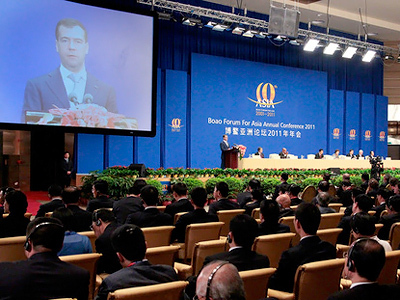 ­Russian gas is arguably what Beijing is most interested in. But there is a stumbling block over price. Shujie Yao, a professor of Economics at the University of Nottingham, believes Russia needs some patience for effective negotiations. But Aleksandr Lukin, director of Shanghai Co-operation Organization Center in the Moscow State University of International Relations, says that disagreement over prices will not influence the political relationship between Russia and China. “It is just a commercial issue. Such issues are usual between many countries, commercial partners, companies. So it does not influence it at all,” he told RT. 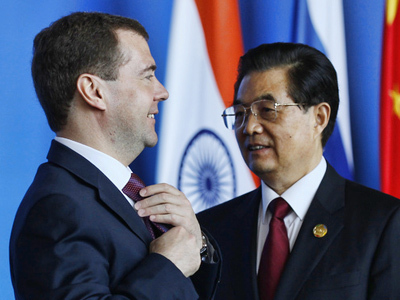 More business deals are expected to be discussed during the next two days as Hu Jintao and Dmitry Medvedev will be traveling to St. Petersburg, where they will participate in the Economic Forum. On Wednesday the two leaders met at the SCO summit, where the questions of Libya and Syria were raised. Both sides share the opinion that diplomatic solutions, both in Libya and Syria, should be preferred over any kind of military presence in the area, potential intervention, or even UN sanctions. 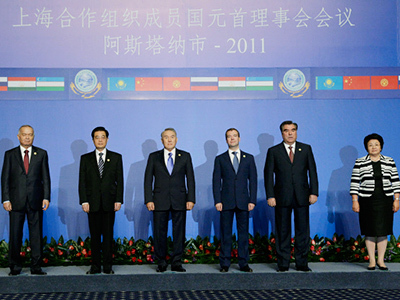 This stance has been reiterated during President Hu Jintao’s visit to Moscow.